Swedish researchers at the Sahlgrenska Academy, University of Gothenburg, Sweden, report that a simple habit may give significant protection against allergy development, namely, the parental sucking on the baby’s pacifier. Allergies are very common in industrialized countries. It has been suggested that exposure to harmless bacteria during infancy may be protective against the development of allergy. However, it has been difficult to pinpoint which bacteria a baby should be exposed to, and at what time and by which route this exposure should ideally occur. Swedish researchers at the Sahlgrenska Academy, University of Gothenburg, now report that a simple habit may give significant protection against allergy development, namely, the parental sucking on the baby’s pacifier. In a group of 184 children, who were followed from birth, the researchers registered how many infants used a pacifier in the first 6 months of life and how the parents cleaned the pacifier. Most parents rinsed the pacifier in tap water before giving it to the baby, e.g., after it had fallen on the floor. However, some parents also boiled the pacifier to clean it. 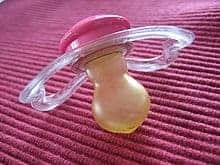 Yet other parents had the habit of putting the baby’s pacifier into their mouth and cleaning it by sucking, before returning it to the baby. It was found that children whose parents habitually sucked the pacifier were three times less likely to suffer from eczema at 1.5 years of age, as compared with the children of parents who did not do this. When controlled for other factors that could affect the risk of developing allergy, such as allergy in the parents and delivery by Caesarean section, the beneficial effect of parental sucking on the pacifier remained. Pacifier use per se had no effect on allergy development in the child. Boiling the pacifier also did not affect allergy development in a statistically proven fashion. No more upper respiratory infections were seen in the children whose parents sucked on their dummies, as compared with the other children, as evidenced by diaries kept by the parents in which they noted significant events, such as infections. According to “the hygiene hypothesis”, the development of allergy can be attributed in part to a paucity of microbial stimulation during early infancy. “Early establishment of a complex oral microflora might promote healthy maturation of the immune system, thereby counteracting allergy development”, says professor Agnes Wold who led the study. The study, which is published in the scientific journal Pediatrics, was performed by a team that consisted of paediatricians specialized in allergic diseases, as well as microbiologists and immunologists. The research team has previously conducted large-scale studies on the gut microbiota in relation to allergy development and showed in 2009 that a complex gut microbiota very early in life reduces the risk of allergy development.